The performance of traditional fixed income investments so far in 2018 highlights the difficulties investors have faced over the past several years. Over the last 10﻿ years, index mutual funds and ETFs have been created to track these markets as well as others outside of core U.S. fixed income. However, many of these investment options focus only on the most liquid segments of the credit markets. An actively managed investment strategy may help investors gain exposure to less-liquid and harder-to-access areas of the credit markets both within and beyond the benchmark indices. 1 Bloomberg, as of November 15, 2018. 2 Last 5 years represents December 31, 2012 to September 30, 2018. Prior 30 years is from December 31, 1982 to December 31, 2012. 3 As of December 31, 2017, representing emerging market government debt, emerging market corporate debt, U.S. high yield bonds, U.S. senior secured loans, European high yield bonds, European senior secured loans, U.S. distressed high yield bonds, and asset-backed securities. 4 Bloomberg and S&P Global Market Intelligence, as of September 8, 2018. Investment grade based on the ICE BofAML U.S. Corporate Master Index. 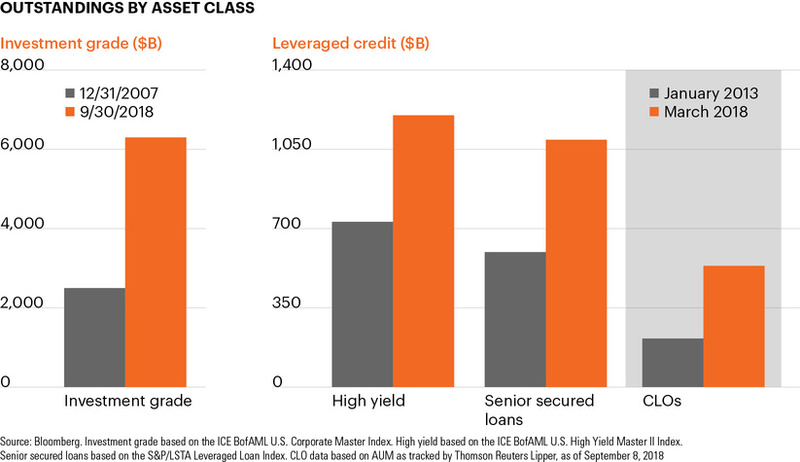 High yield based on the ICE BofAML U.S. High Yield Master II Index. Senior secured loans based on the S&P/LSTA Leveraged Loan Index. CLOs based on the J.P. Morgan CLO Index.